"Northern Flicker", 10"x14" watercolor. Love this bird! I recently completed three paintings for the California Rice Commission (CRC) and the third and largest one was of Sandhill Cranes dancing which I titled "Elegance". The best part of creating these art works was visiting rice farms along the Sacramento Valley. One particular farm I really enjoyed visiting was Montna Farms just south of Yuba City. The vast openness of their fields was really peaceful so it was very easy to be inspired to paint. The design on the left was inspired from that visit. Took a walk down an industrial part of Sacramento and noticed several dead trees and dead vegetation. Everything was brown and lifeless. But I also noticed this amazing great-horned owl watching me as I searched for signs of bird life. Amazing that such a large predator can survive in a disturbed environment. 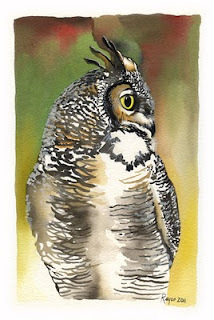 "Great Horned Owl", watercolor on 14"x18" cold-pressed paper. I first saw this species when I was admiring the trees outside the Shrine of St. Therese in Juneau and noticed branches with square-like patterns. It didn't take long for the culprit to show up. 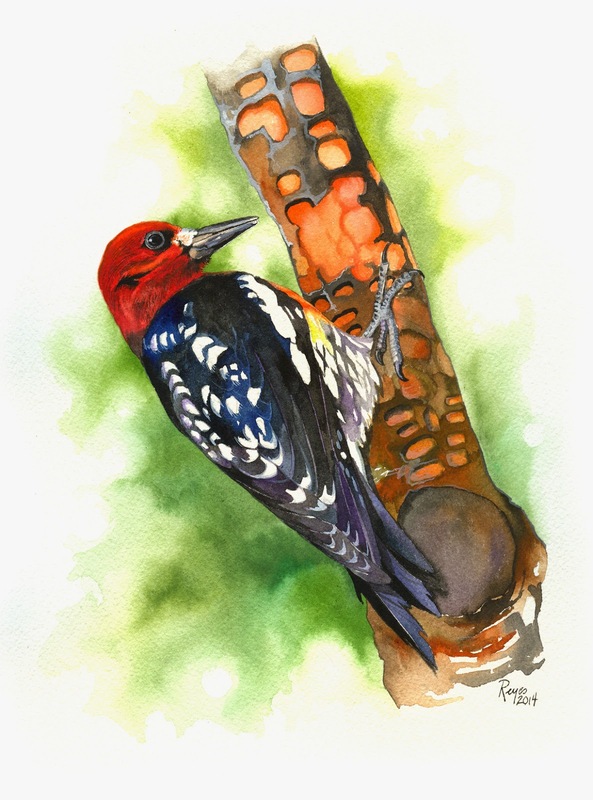 "Red-breasted sapsucker", watercolor on 10"x14" cold-pressed paper. 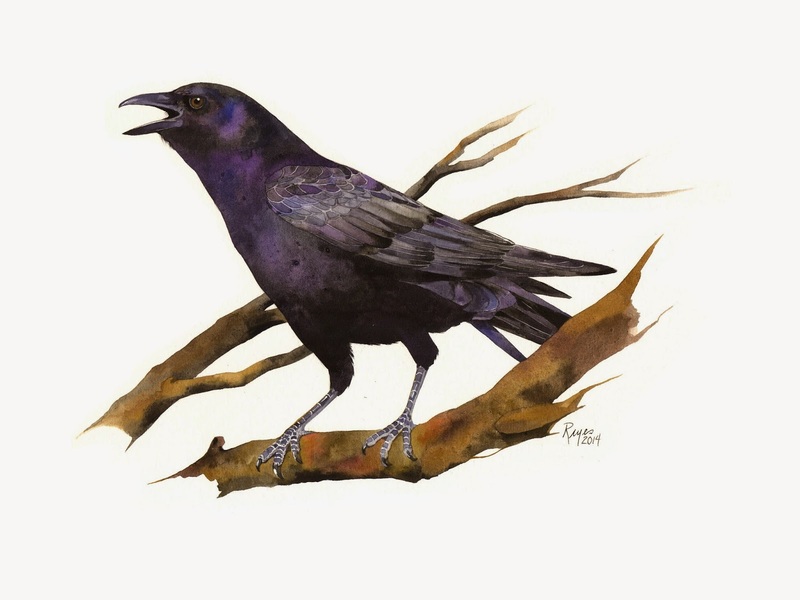 In the Central Valley, crows are a common fixture of the landscape. I actually witnessed crows mobbing and attacking a duckling while I was a student in UC Davis. It was murderous. 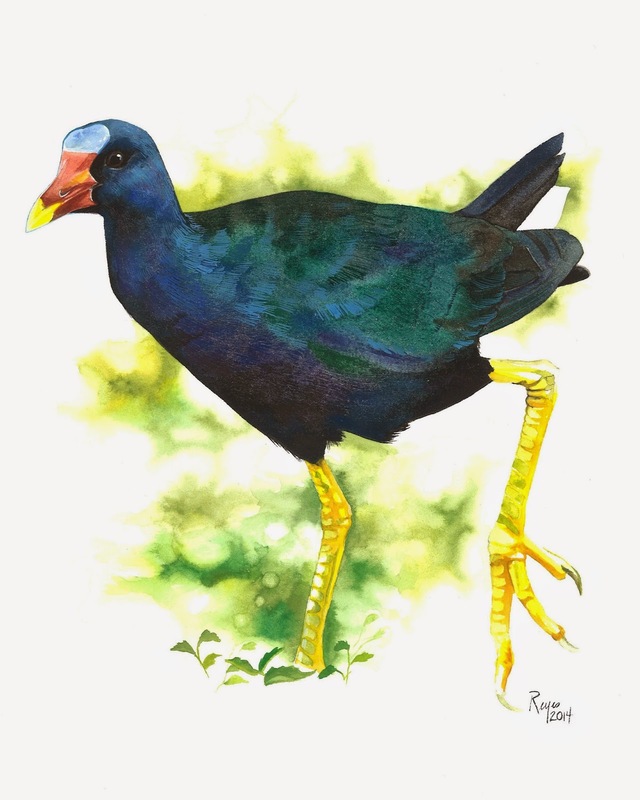 This Floridian gallinule looks similar to its Californian cousin, the Common Gallinule, but more colorful. On a recent visit to Florida, I asked my wife to show me a place where I can find purple gallinules. She took me to a public park surrounded by homes and sure enough, there were purple gallinules feeding with the common white ibis. I assumed they would behave similar to the more secretive rail but they were actually pretty easy to find. A painting of a turkey vulture keeping an eye on a potential meal. "Waiting", gouache on 10"x14" cold-pressed paper. 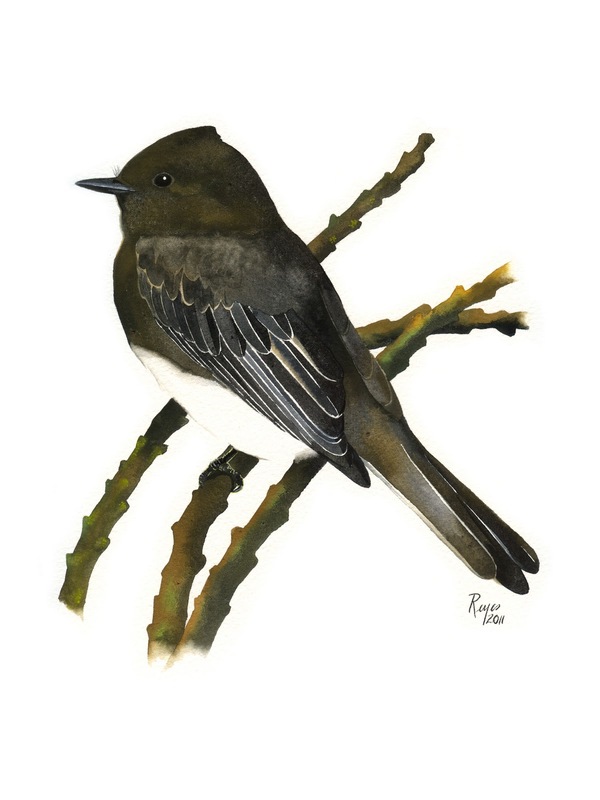 Autumn is migration time in California. 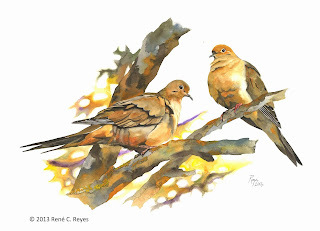 However, I can't forget our year round resident, the mourning doves. This one's titled "Autumn mourning". 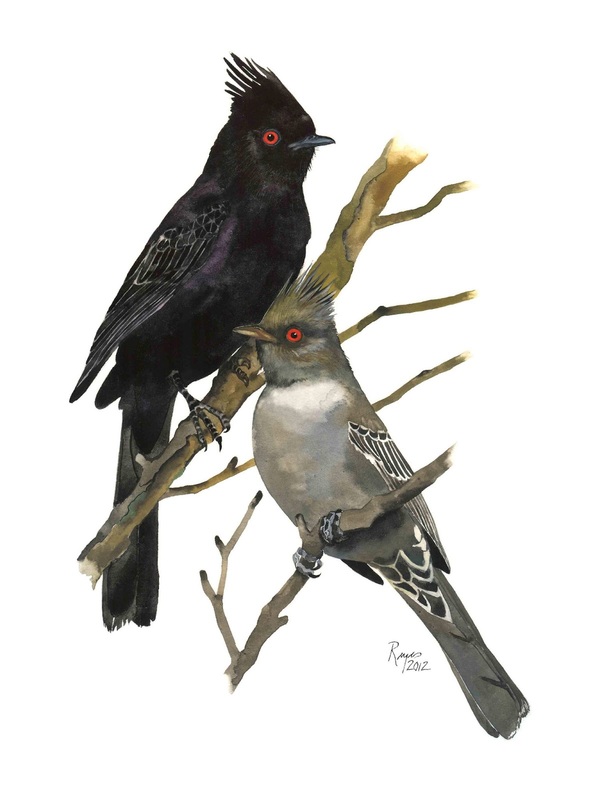 I took my first ornithology class as an undergrad at UC Davis with Dan Anderson. Back then, I was studying fisheries since my goal after graduating was to do sustainable aquaculture somewhere. I was required to take his ornithology class where I had to memorize all the species of California birds using "bird on a stick" avian specimens. Luckily, there was more to ornithology than looking at dead birds. 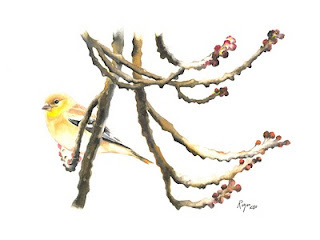 I remember one particular class outing where we listened to several bird calls coming from a large shrub. He named all the birds making the calls and, after a few minutes, we "flushed" the birds from the shrub. Of course, we were all amazed at how he was able to identify all these birds by sound. It may be that he was just fooling us but somehow, I don't think that was the case. On a short trip to Indonesia, I was lucky enough to bird with Boas Emmanuel, Jakarta's premier bird expert. What amazed me most about him is how his ears were always "perked up" to bird calls. 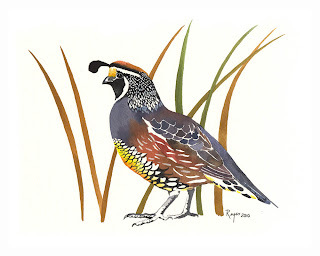 Several times during outings, he heard birds and identified them before seeing it. 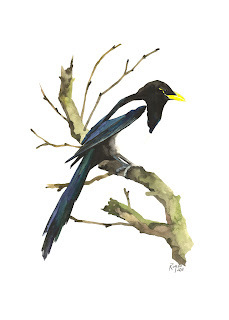 This talent is probably what separates great birders from ordinary bird admirers like myself. This painting is of a sooty-headed bulbul, an Indonesian species, courtesy of Boas. 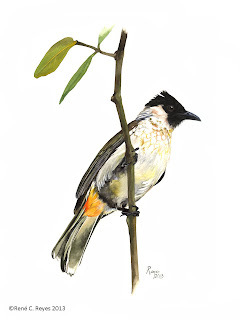 "Sooty-headed bulbul", watercolor on 9"x12" Lanaquarelle paper. 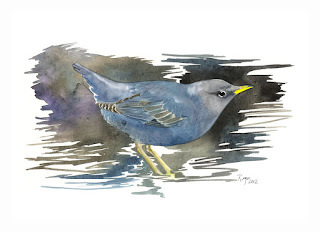 This American dipper, our only aquatic songbird, was from the Mokelumne River near Lodi. The bird was more dark grey but I decided to use blue-grey instead for this painting. 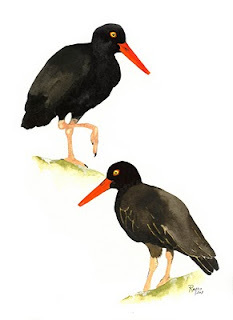 I was reading that this bird is better known as the "water ouzel", a term I have never heard used for this bird. I first saw this species in Ogden, Utah on my way to a friend's wedding. I spotted a small stream and, with my fancy dress shoes, decided to walk along the stream, locate a rock to sit on, and listen to the running water. While sitting quietly, a dipper decided to show me a spectacular water show (dipping and diving), often coming up with an invertebrate or some other insect. Very fascinating! Interestingly, this was John Muir's favorite bird, and I can see why. 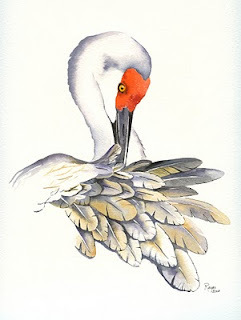 It is that time of year again when sandhill cranes winter in the Central Valley. Just earlier this month, Lodi celebrated its annual Sandhill Crane Festival which is always a treat. Lodi, like a lot of other towns in the Valley, are smitten with the wine industry and the prestige that comes with it. In fact, it is the home to the famous Mondavi Woodbridge Winery. Furthermore, grapes harvested in Lodi are actually used in the well-known Napa wines so one can say that Lodi's wine is good enough for Napa or even better than Napa wines. Wineries in the Lodi area are growing and it seems that new ones pop up every year. This may seem like a great development for Lodi but this does not bode well for sandhill cranes that rely on farmers flooding their grain fields. More and more land in the Lodi region are being converted to vineyards which are not flooded and do not provide the same feeding and habitat as a flooded field. When fields are flooded, it is loaded with critters and grain that the omnivorous sandhill cranes feed on. They also use sandbars and flooded fields for sleeping (a predator would have a hard time sneaking up on crane when it is surrounded by water). Furthermore, with vineyards, there is nowhere to land or feed. 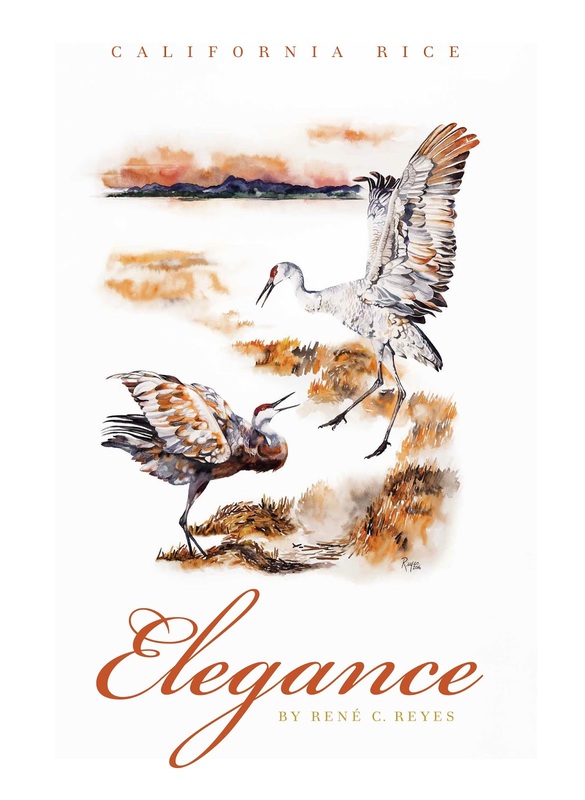 Lodi seems to be at a crossroad between celebrating the arrival of a bird through the town's successful annual homage to the sandhill crane and the wealth and fame that wineries bring to a region. It is yet another example of choosing what is more important to us: preserving what is left of our heritage (land and nature) or developing the fertile land for economic reasons. I love wine but I love birds a lot more. I hope Lodi chooses birds too. 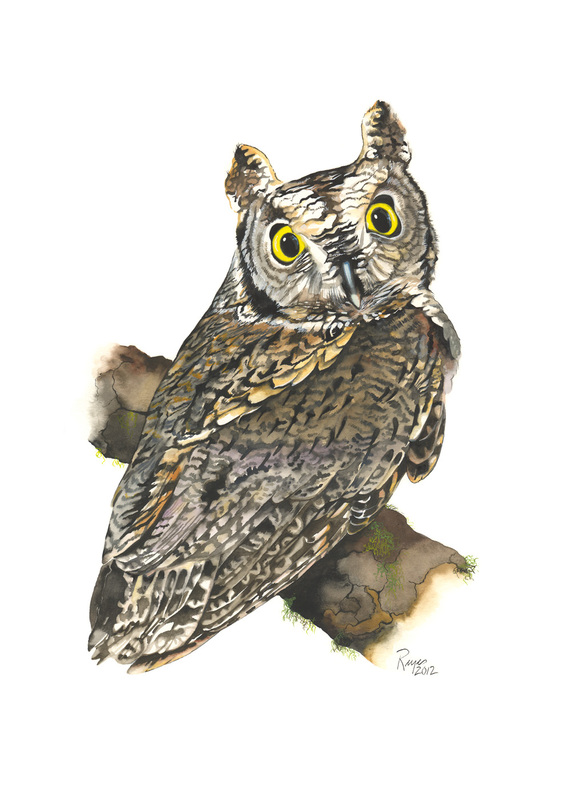 One day at work, I saw a great horned owl in the middle of the day near a dead pigeon. I couldn't figure out what exactly it was doing because I always thought that owls were nocturnal hunters and are not likely to go after daytime prey. I was able to approach this certain owl but I decided to leave it alone since it did not look injured. It stayed in that area for another day but eventually it moved on. Coming face-to-face with a large bird like this is really exhilarating. This painting is titled "The night watchman", watercolor 10"x14". 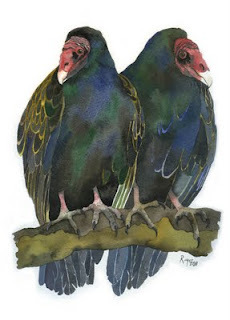 I've been learning a lot about this species from the Turkey Vulture Society. I always thought they were not picky eaters but it turns out that they prefer to eat meat from an herbivorous animal than from a dead carnivore. 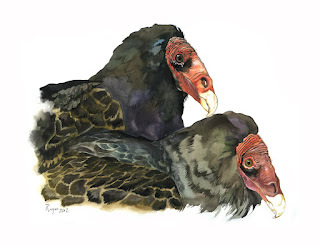 They're also not related to the Old World vultures according to DNA analysis which means that their similarity to the Old World vultures are because of convergent evolution. In other words, their similar traits evolved separately. My next painting of these species will be of them sunning themselves in a group, which I also learned is called a venue. This painting is a portrait of these beautiful birds. Borrowed from a title of a book written by Pete Dunne, this painting is titled "Wind masters". Longfin smelt is another fish species from the Sacramento-San Joaquin River Delta that is in decline. According to the Center of Biological Diversity, the San Francisco Bay-Delta longfin smelt population has been at just 3 percent of levels measured less than 20 years ago. I don't quite understand why it is not listed. 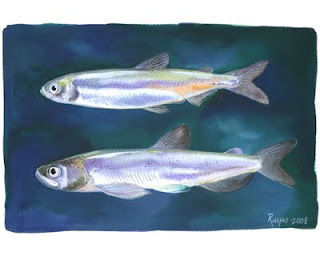 This painting is a liberal interpretation of the mostly bright silver colored longfin smelt. 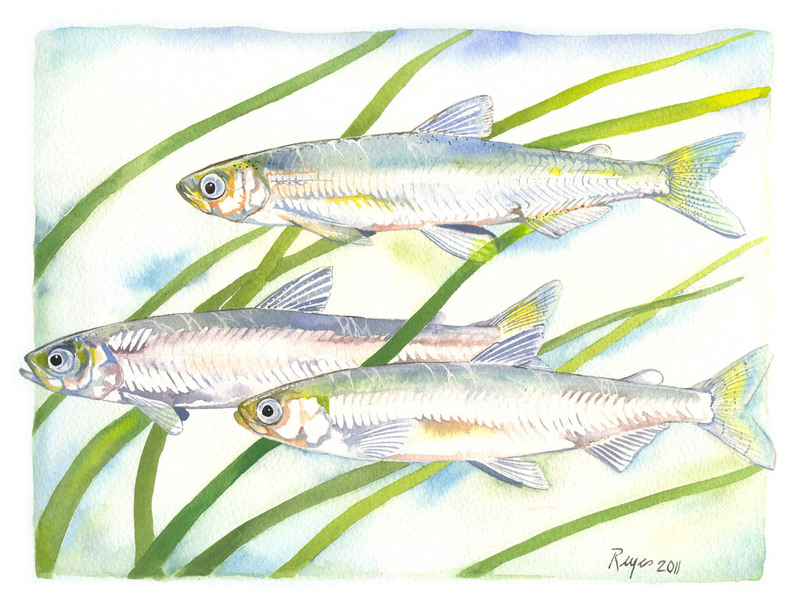 "Longfin smelt", watercolor on 10"x14" Lanaquarelle paper. 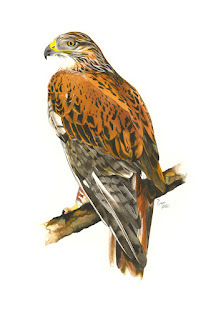 The Central Valley is always a great place for hawk watching during winter. 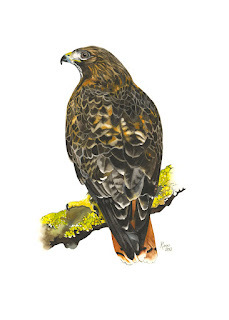 One of the larger hawks that visit the valley is the ferruginous hawk, a hawk that gets its name from its iron-rust coloration (Latin ferrgin). 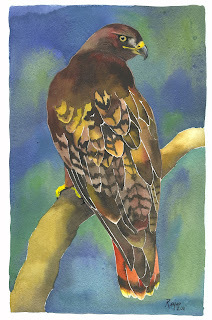 This one's titled "Chianti's hawk", watercolor 10"x14". 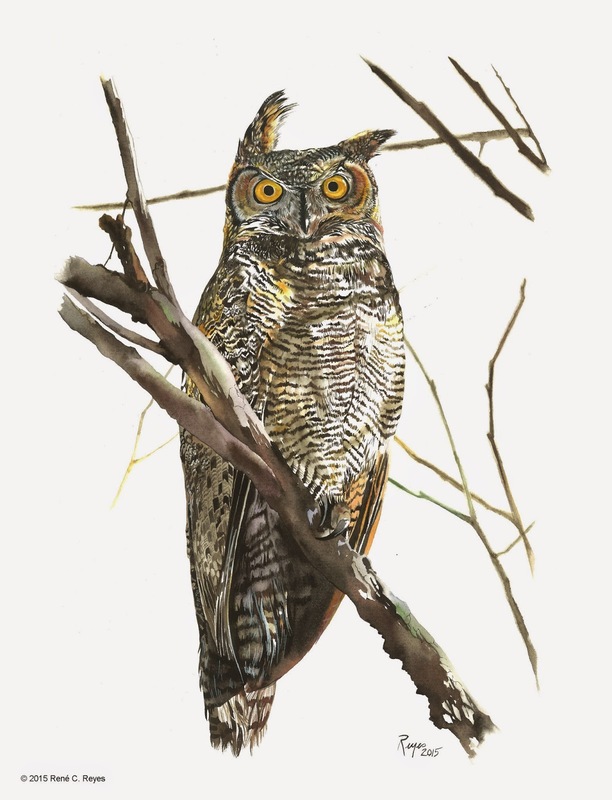 Western screech-owls have an interesting way of camouflaging itself, not just through its mottled coloration but also by stiffening its feathers to make it look like a branch (source: The Owl Pages). Although pretty common at lower elevations in California, I've heard this species more than I've actually seen it. Interestingly, they don't screech so the name is misleading. 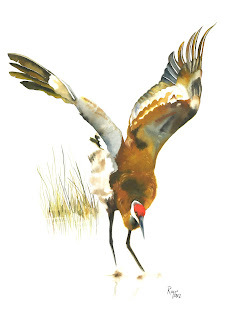 This painting was based on an individual being rehabilitated in the Bay Area. 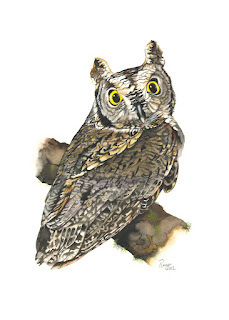 "Western screech-owl, Megascops kennicottii", watercolor on Lanaquarelle paper, 10"x14". A painting of a red-tailed hawk from San Simeon, a sea side town near Morro Bay. Along Hwy 1 that passes through this town, one can see several of these hawks perching on fence posts...not as many as in the Central Valley, but numerous enough to enjoy. "San Simeon's eyes", watercolor on hot-pressed paper (Lanaquarelle), 10"x14". I had the pleasure of learning about this bird from the folks at Pacific Wildlife Care during the Morro Bay Winter Bird Festival. 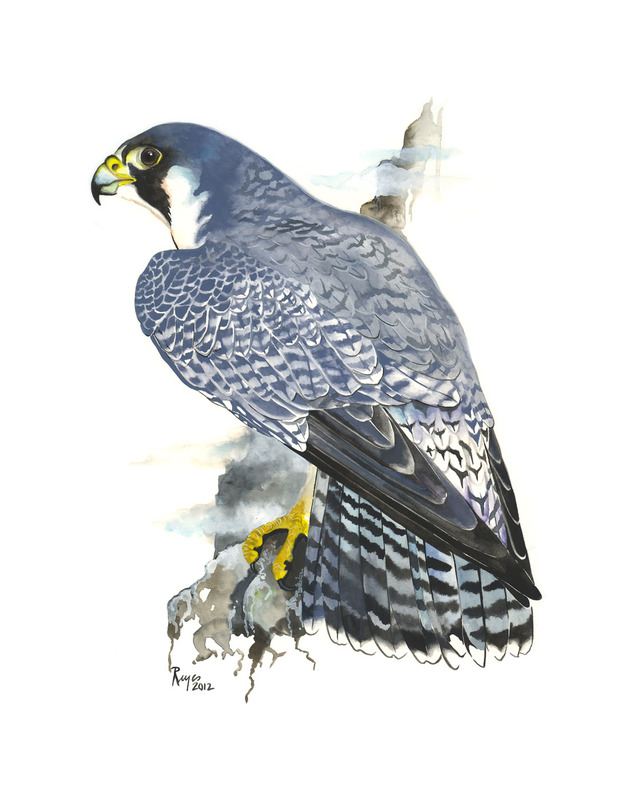 The peregrine falcon was in the endangered species list from 1973 to 1998. DDT, a pesticide that thinned the egg shells, was the culprit. By 1972, the year I was born, this species was gone from the East Coast and there were only two pairs left in California. 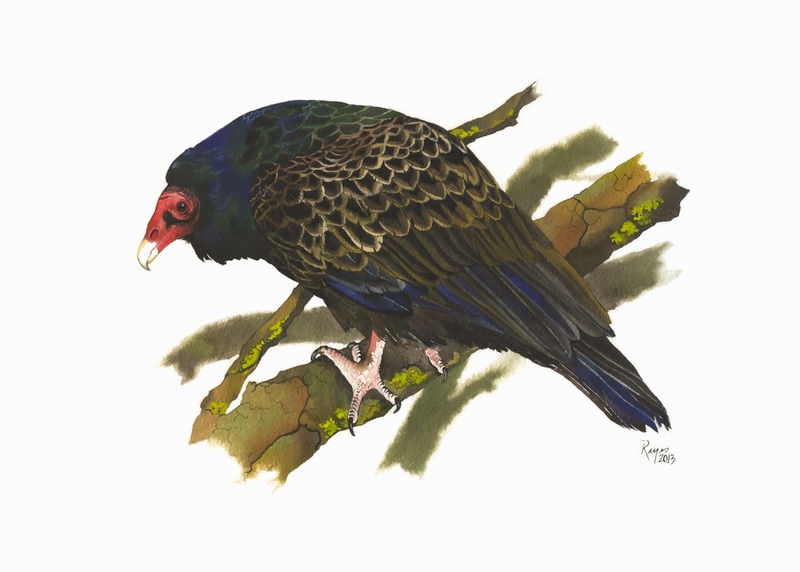 One of the pairs was in Morro Rock which was instrumental in the recovery of this bird. The eggs from this pair were incubated and used for captive breeding by biologists. Now, they're fully recovered. It truly is amazing how close the peregrine falcon was to extinction. This painting is titled "Watching over Morro", watercolor 10"x14". Cape buffaloes (Syncerus caffer) are really fun to paint probably because they have some similarities to adult human, male facial features. Another name for an old buffalo bull is “dagga boy”. I don't really know the origins of that name although I do know dagga means mud in Zulu. 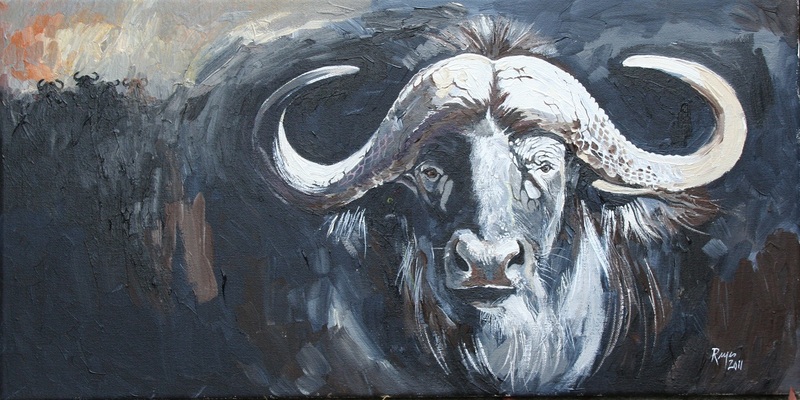 This is a painting of an old Cape buffalo bull, known to wallow in mud. I saw a herd of these guys in South Africa's Kruger National Park and I specifically recall looking at a really majestic bull. 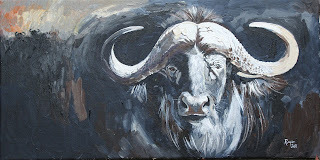 I hope I am able to capture that bull's intense look with this painting. "Old Cape", acrylic on canvas, 22"x12". 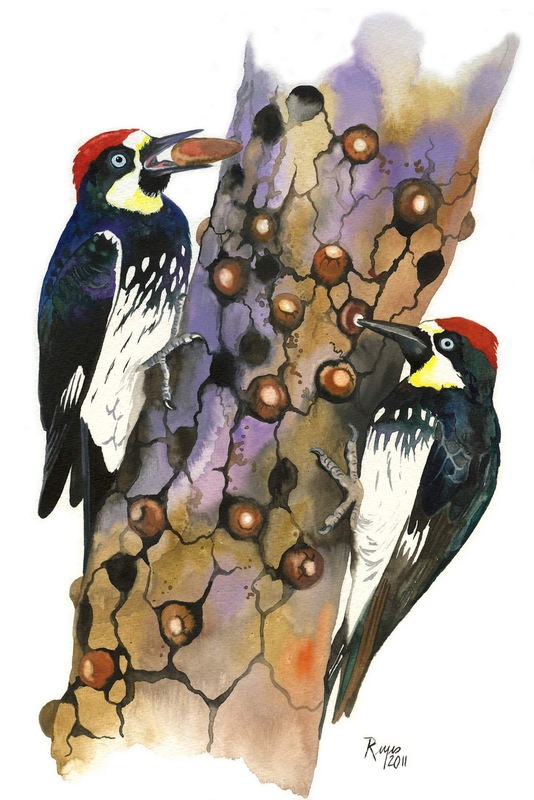 Acorn woodpeckers have a pretty complex social system where communal nesting and food storage play a big part. Acorns are stored in trees called "granaries" and is an important food source for the winter. This painting shows a couple of acorn woodpeckers collecting and storing acorns in a granary. 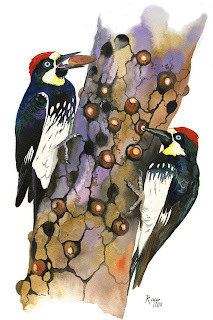 "Tic-tac-toe, acorn woodpeckers", watercolor 12"x16". This painting of a yellow-billed magpie was created almost entirely from memory. 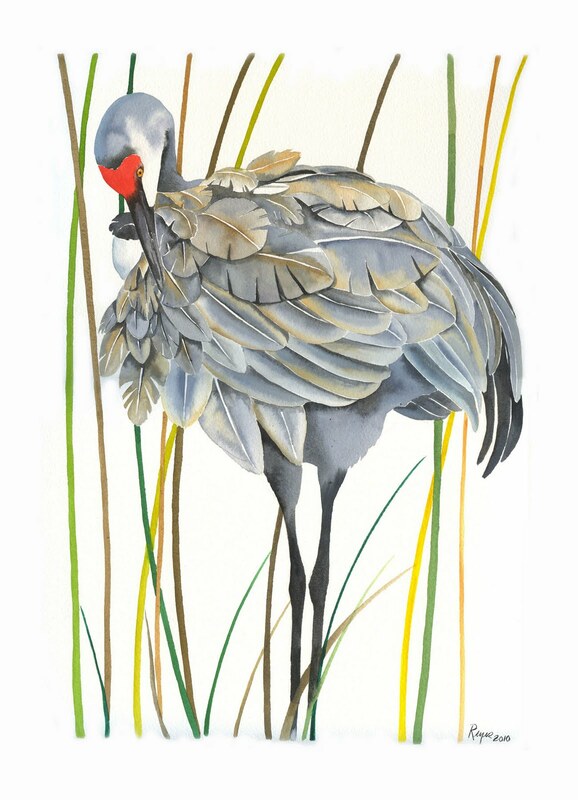 The only other bird I can paint without any visual aid is the sandhill crane. "Perching simplicity", 10"x14" watercolor (Original SOLD). A couple of days ago, I had the great opportunity to see sandhill cranes up close at the Isenberg Reserve on Woodbridge Rd. in Lodi. Most were the lesser sandhill cranes but there were a few greater sandhill cranes which are State listed as threatened. 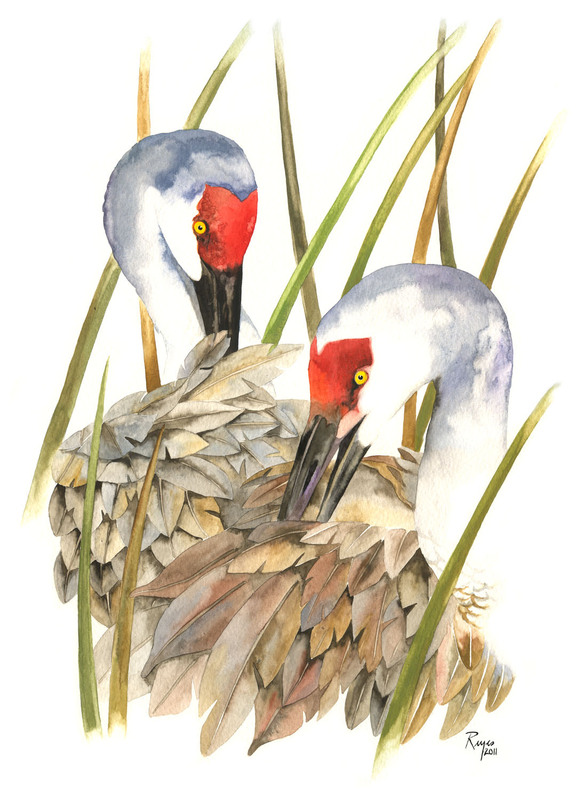 This painting is one of several paintings I have been working on in preparation for the annual Lodi Sandhill Crane Festival which is on its 16th year. "Woodbridge preening", watercolor 12"x16". The Cornell Lab of Ornithology begins the description of the turkey vulture with the words "ugly, bare-skinned face". It does have a bare-skinned face but certainly not an ugly one. I guess even respectable organizations are still ran by subjective humans. "Double trouble", gouache 8"x11" (Original SOLD). Delta smelt is a species of fish in the Osmeridae family. 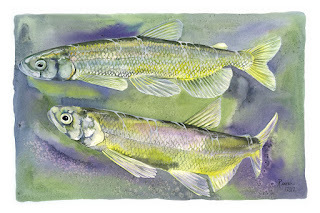 The media often calls it a minnow, Cyprinidae family, which is completely wrong. Minnows are fishes like goldfish and shiners and are really hardy. Delta smelt, on the other hand, are sensitive to environmental changes which makes it a great indicator of water quality and pollution. By calling it a "3-inch minnow", the talking heads are trivializing the importance of this fish and are forgetting the bigger picture. What they are glossing over is the fact that the Sacramento-San Joaquin Delta is in poor health; the alarming decline of Delta smelt should be a wake-up call. Unfortunately, the loudest mouths in the media often drown out reasonable arguments. The painting above left is titled "Smeltdown in the Delta" (SOLD), a phrase I borrowed from the Center for Biological Diversity. The one on the right is titled "Cousins". I had just completed showing my work at the annual Pacific Flyway Association's Classic Wildlife Art Festival this weekend. 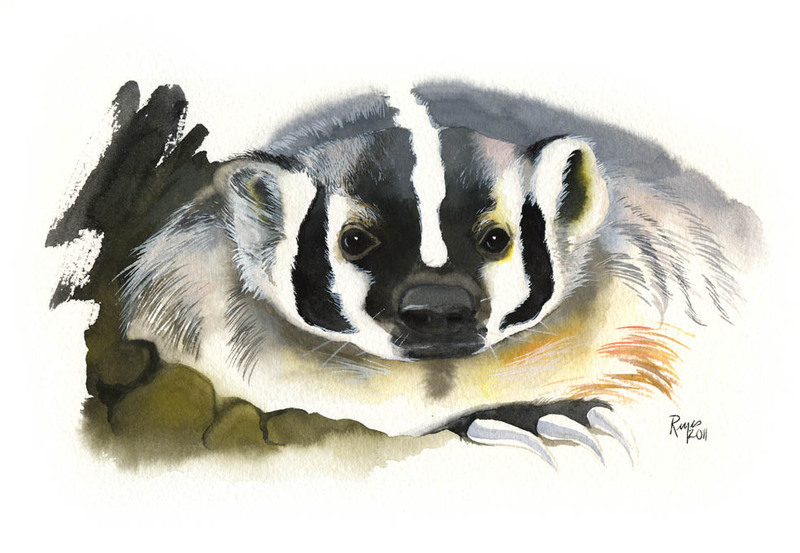 I was surrounded by really big name duck stamp artists, the likes of Robert Steiner, Sherrie Russell Meline, and Steele Roberts-Ross. I don't strive to reach their caliber since their work is purely amazing and takes a lot of patience and great attention to detail. I've tried doing the "duck stamp" quality painting but it always just comes out muddy and I never finish them. At least I know what I will never be: a duck stamp artist. Here is one of a non-waterfowl, a favorite of mine. 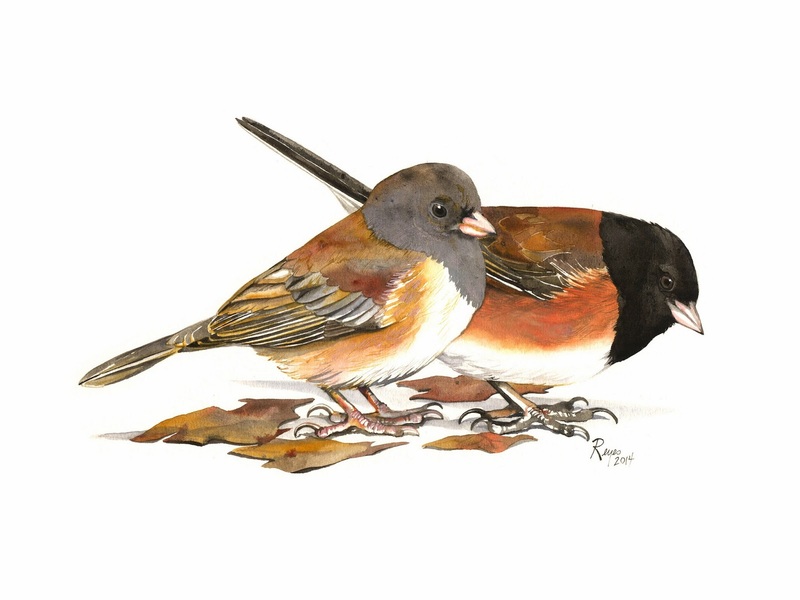 This one's titled "Rufous", gouache 11"x14". Kentucky will start hunting Sandhill Cranes. I am so disheartened by this news. I wonder when will people start appreciating the beauty of wildlife without having to kill it? I hope people will take time to write this state's legislators. Attached is a link to a site that lists Kentucky's lawmakers. I am not against hunting but these are sandhill cranes! 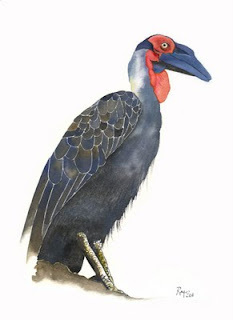 A painting of a southern ground hornbill, a bird I saw in South Africa. Gouache, 9"x12". 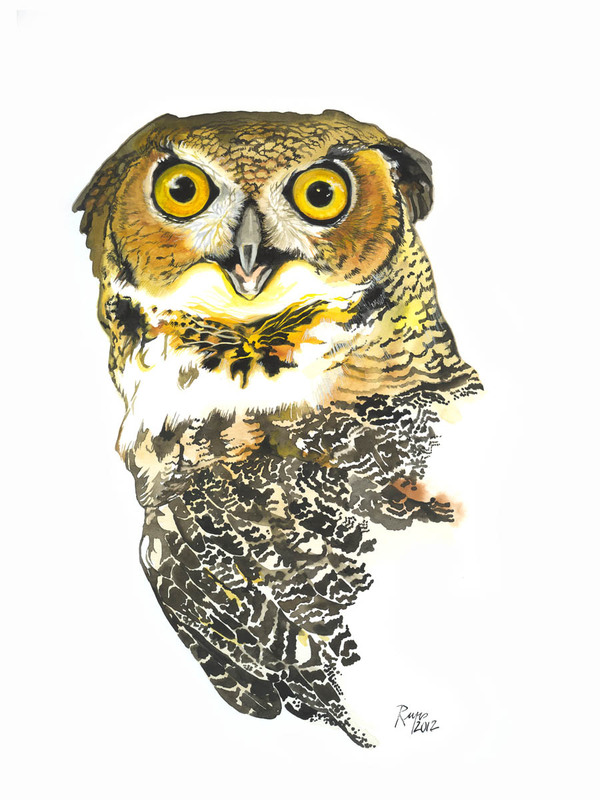 A quick watercolor sketch of an owl. 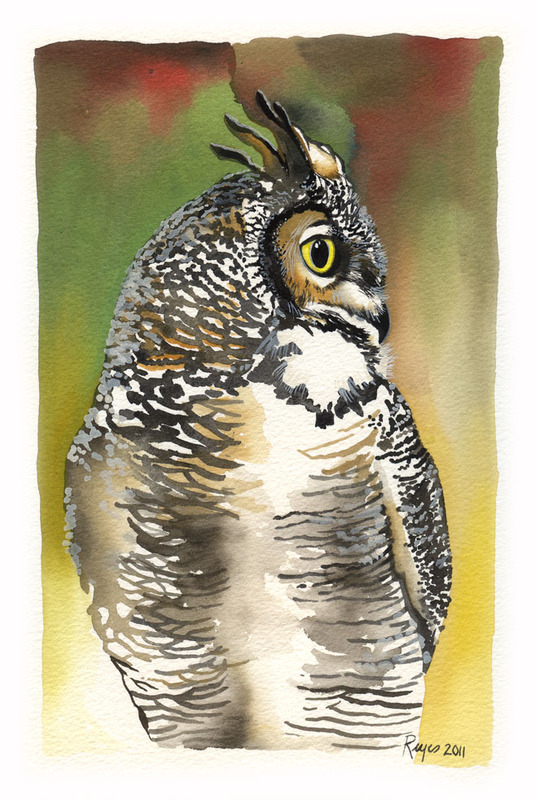 "Portrait of a great horned owl", gouache 6"x10" (SOLD). 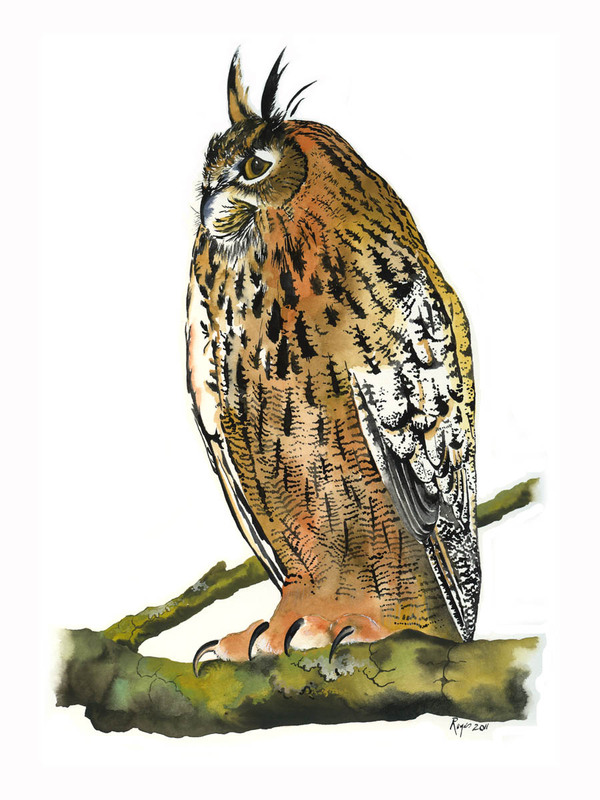 This is a painting of a Eurasian eagle owl. Obviously not from California. 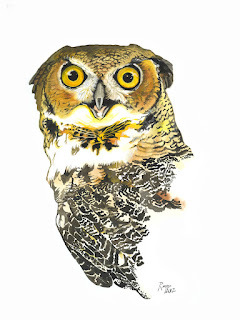 This was actually an "education owl" from Native Bird Connections. 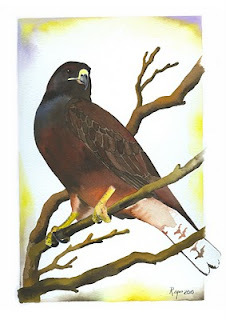 I donated this painting to the wonderful folks at Native Bird Connections since they do so much to educate people on avian biology. Red-tailed hawks are year-round in the Valley. This is one of my favorite raptors to paint because of the numerous variation in color and morphs. 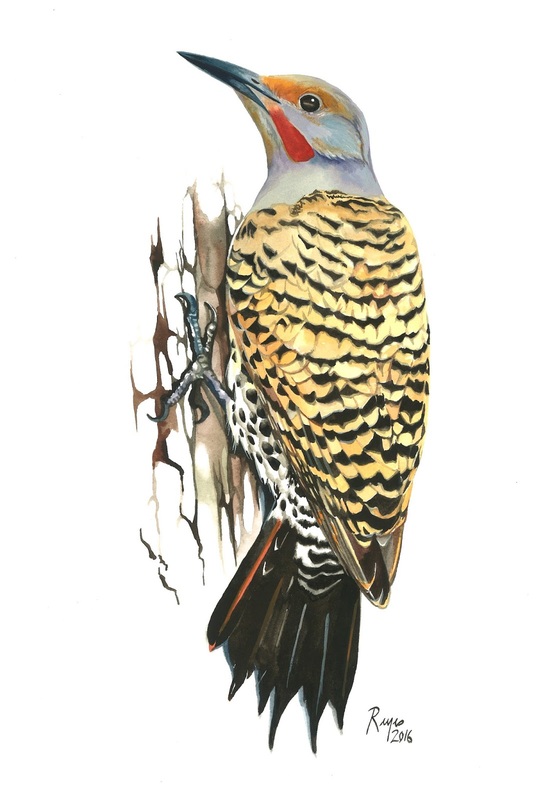 This one is of a juvenile that is almost an adult, titled "Valley eyes", watercolor 12"x16" (SOLD). On our way to San Luis Reservoir for a zebra mussel veliger sampling, my colleague and I were driving on Hwy 152 when a large blue colored bird flew over our vehicle. As soon as we looked back, we immediately knew it was a roadrunner. I've seen them on the ground usually so I was amazed to see one flying, especially over a busy highway. Seeing this bluish bird in flight reminded me a lot of the great blue turaco I used to encounter often in Gabon's forest. To some people, smell is something that brings back memories. To me, it is the sense of vision that brings back more vivid memories. 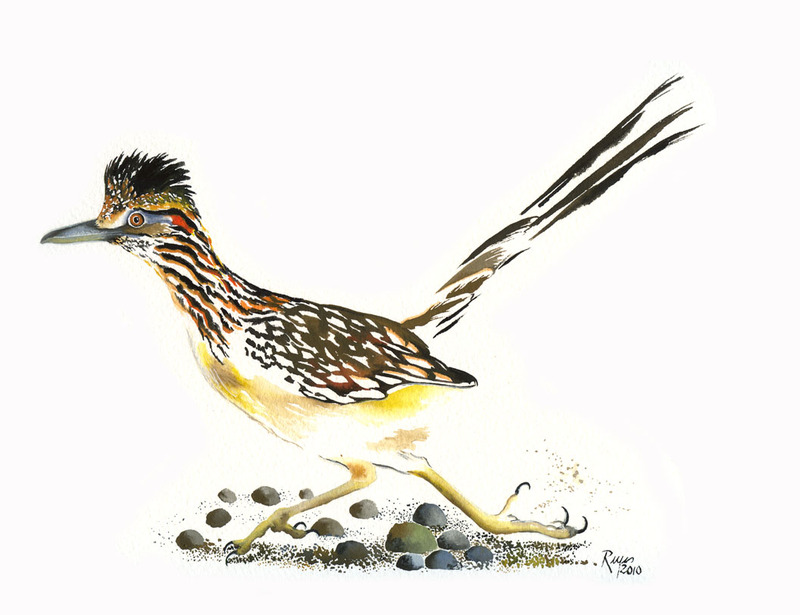 This painting is called "Pacheco runner", watercolor 16"x12". Three snowy plovers in Morro Bay. 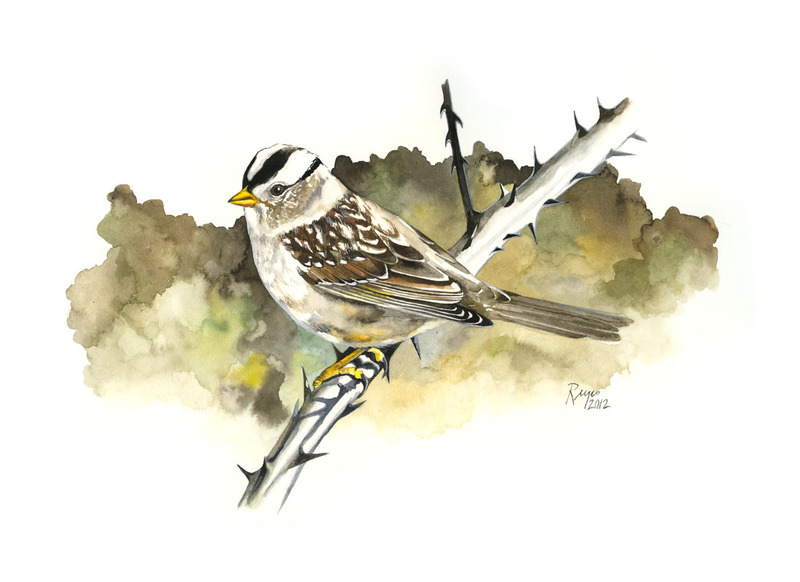 Interestingly, the female leaves her mate and brood about the same time chicks hatch and then initiates a mating with another male. The Cornell Ornithology guide is just a wealth of knowledge. 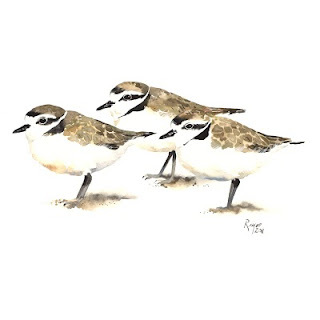 "Morro's plovers", watercolor 8"x8". 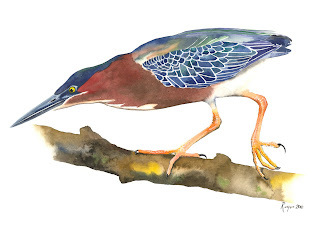 Green heron, according to Cornell Lab, is one of the few tool-using birds. They've been observed dropping bait (insect, earthworm, twigs, etc.) on the surface of the water then grabbing small fish that are attracted. That is pretty cool. This is a painting of an adult eyeing a fish, perhaps after dropping its lure. 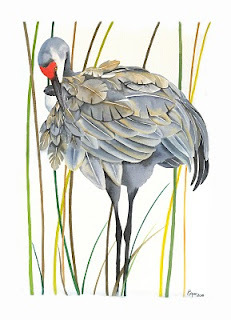 "A balancing act", watercolor 16"x12" (Original SOLD at Lodi's Sandhill Crane Festival). 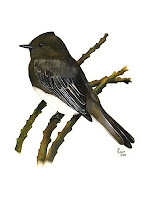 A painting of a black phoebe, a fairly common flycatcher in the Central Valley. Painting this bird was a little tricky since it is mostly a play on greyscale. "Black sillhouette", gouache 10"x14". 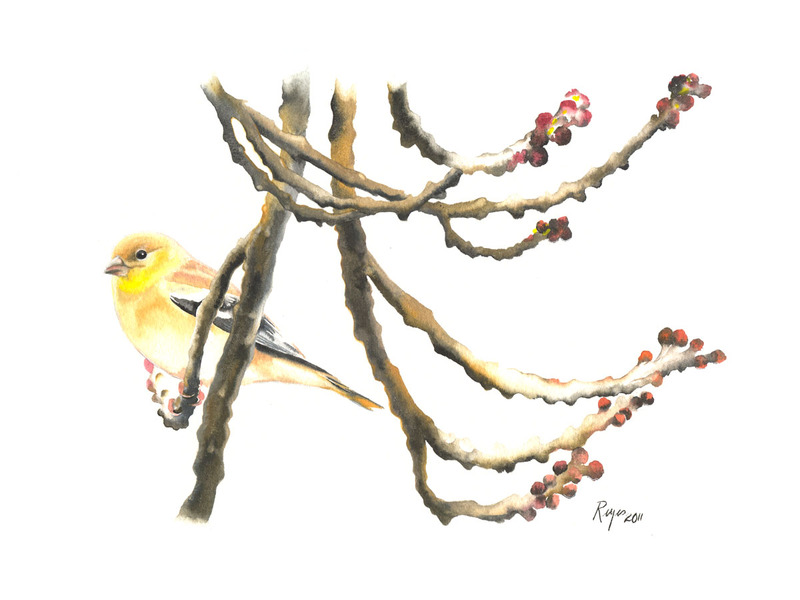 My first bird painting of 2011, one bird from a big flock of American goldfinch that hangs out in our backyard. "Golden winter", gouache 14"x10" (SOLD). Xantus's murrelets, gouache 12"x7". 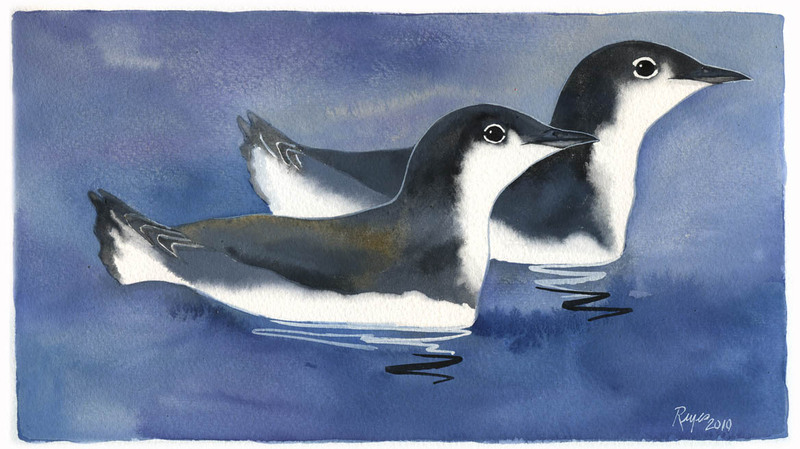 These were seabirds I saw in Alaska this past summer. 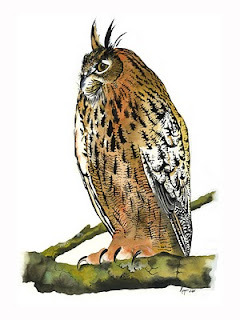 I've always thought these owls were only found in old growth forest of northern California and the Pacific Northwest. 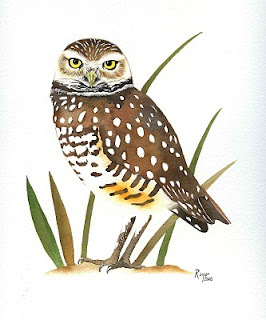 However, there are actually 3 subspecies of spotted owl, the smallest one found in Mexico. The spotted owl was recorded by a Hungarian immigrant named John Xántus Janos, the same guy the Xantus's murrelet and Xantus's hummingbird were named after. 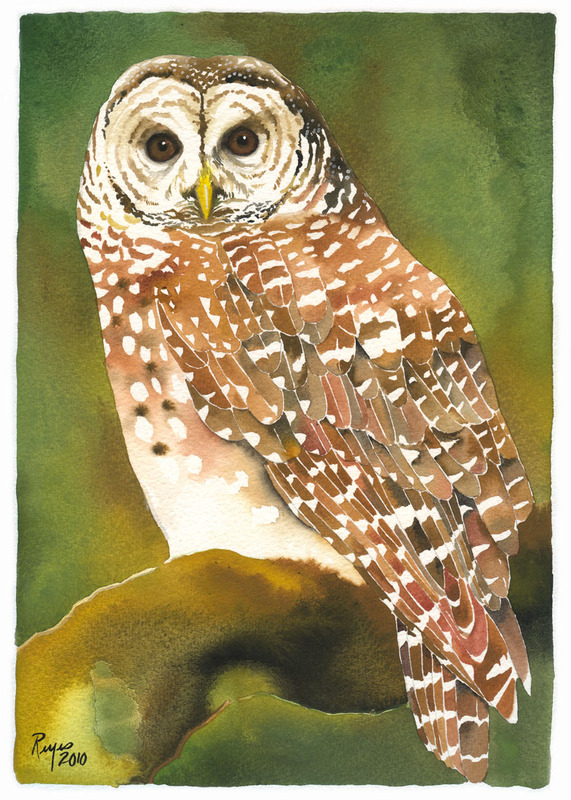 This painting was actually inspired by the rehabilitated owls I am lucky enough to observe through several rehab organizations and individuals. 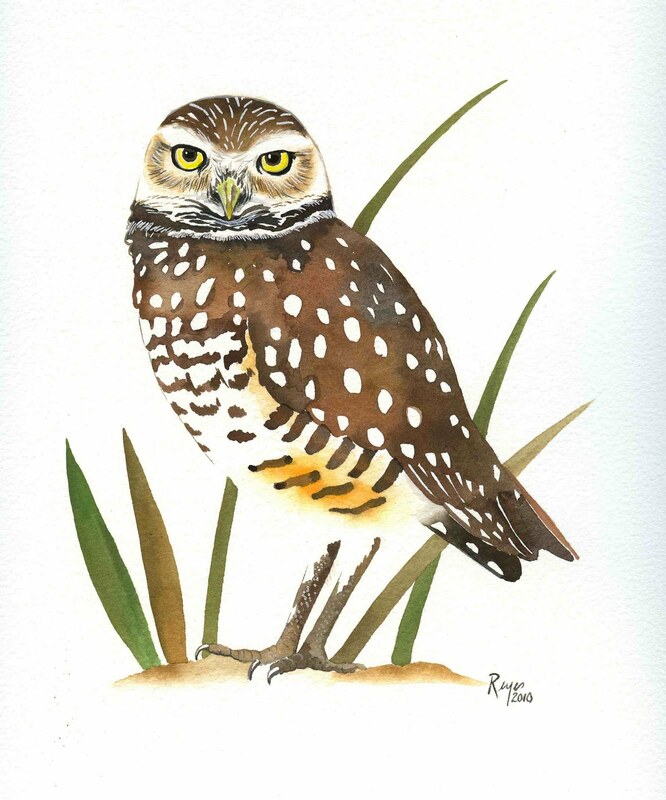 This painting is titled "Forest eyes, spotted owl Strix occidentalis", gouache 8"x11". 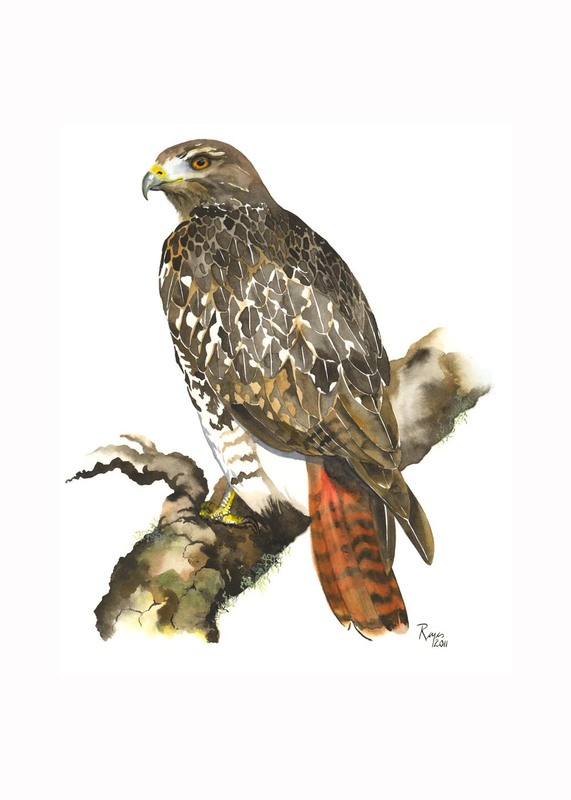 While looking for fish eggs one day in the southern part of the San Joaquin delta, a dark colored Swainson's hawk was calling repeatedly to another Swainson's hawk. I was surprised to see two dark-morphs in the same tree. I guess I shouldn't be too surprised since the Central Valley is hawk heaven year round. This is a painting of one them. "The Dark Morph". 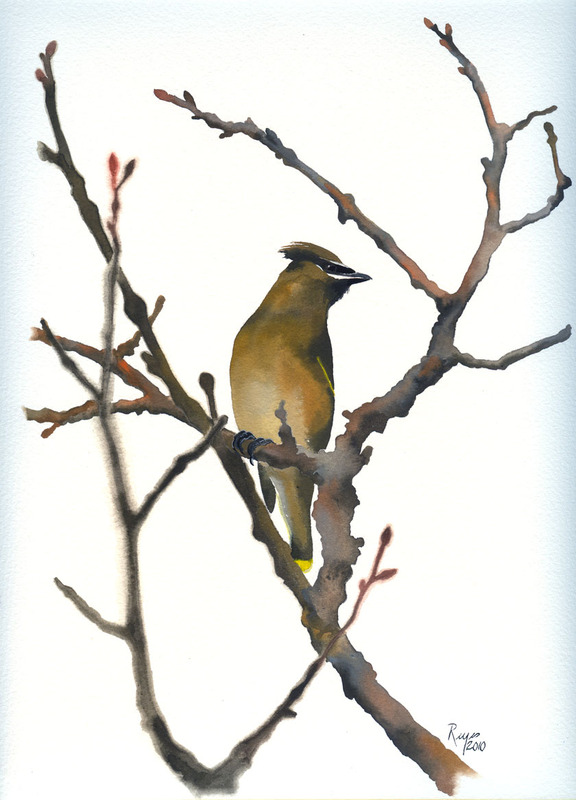 On a cool fall morning, cedar waxwings can be heard whistling and weighing down our front yard trees. They also leave quite a mess on our vehicles. This painting is titled "Noble waxwing", gouache 9"x12". SOLD (Morro Bay). In the late evenings when we let the dogs out one last time, I can hear sandhill cranes calling from afar. When I am really lucky, on a full moon especially, we can see their silhouettes overhead. Their calls make chilly Novembers bearable. 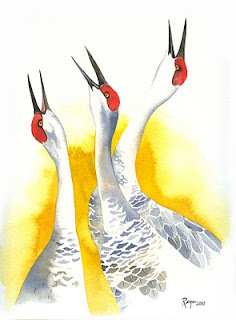 This watercolor painting is of three sandhill cranes calling at the Isenberg Preserve. 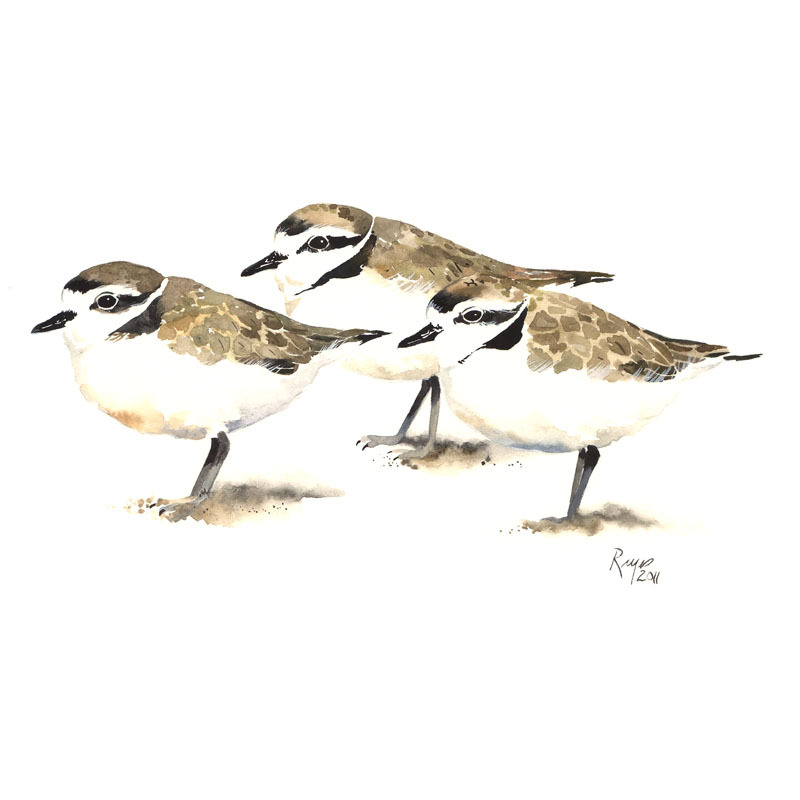 "Trio", 9"x12", Original SOLD (Klamath Falls Winter Bird Festival). "Elegance", watercolor and ink 10"x14", Original SOLD. 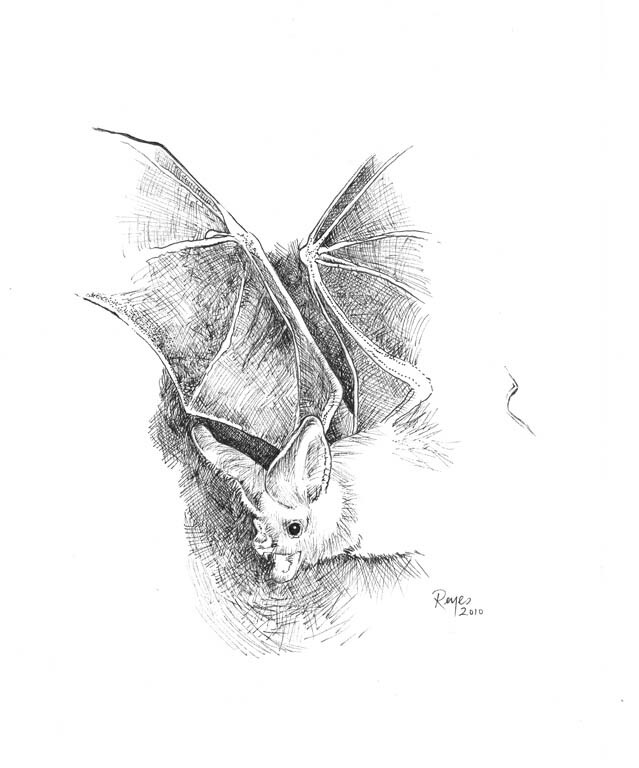 "California leaf-nosed bat", pen and ink 6"x8".